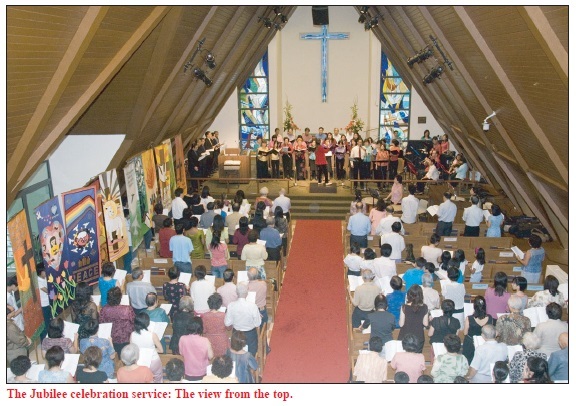 AFTER months of planning, rehearsals, coordination, and prayer, the day finally arrived – Sept 10, 2006 – the Jubilee celebration service of Trinity Methodist Church (TMC). Members and guests started arriving an hour early in order to get a seat in the sanctuary. Musicians shifted uneasily in their seats next to the combined choir dressed in almost all the colours of the rainbow. Some had never performed in this church before, but sacrificed many hours preparing for this special occasion. As the band and the choir brought in the introit, and the youths of the church marched in carrying magnificent banners lovingly designed and made by various church members, it was clear that all the effort had not gone to waste. God meant the jubilee to be a time of liberation (Leviticus 25), where debts among Israelites were forgiven, and people could reclaim possession of their original inheritance and enjoy a new beginning. Through music and prayer during the anniversary service, the congregation sought to affirm the Lord’s greatness, remember His faithfulness to us in the past, and also prepare us for the future, as we look to Him for our new beginning. Both clergy and lay people participated in the service. 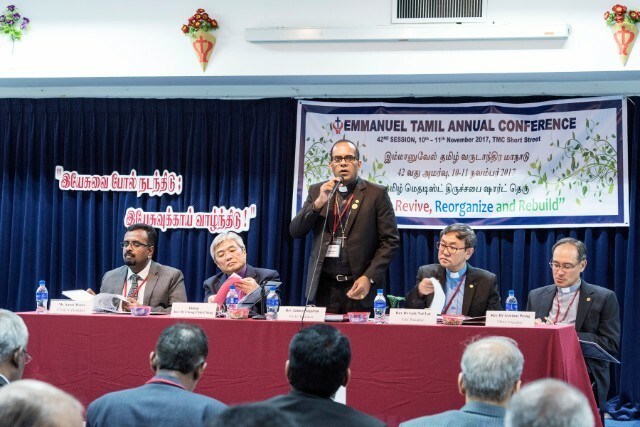 Our Trinity Annual Conference (TRAC) President, the Rev Wee Boon Hup, and District Superintendent, the Rev Dr Jonathan Seet, led in prayers while our Lay Leader, Mr P. Sathiasingam, led us in a time of confession, and our LCEC Chairman, Professor Hum Sin Hoon led us in thanksgiving. The children collected the offering and performed a song item, “What Gift Can We Bring”. Bishop Dr Robert Solomon in his sermon reminded us of what the church should be, drawing illustrations from the early church as described in Acts 2:42-47. This church was shepherded by God, with a baptised community that identified with Christ’s death and resurrection. A church needs sound biblical teaching, breaking of bread, prayer, and fellowship, he said. A church should also be set apart with a saintly fear of God. We were also encouraged to focus on Christ and live out our faith in our community. Growth would follow naturally, as it did in the early church. 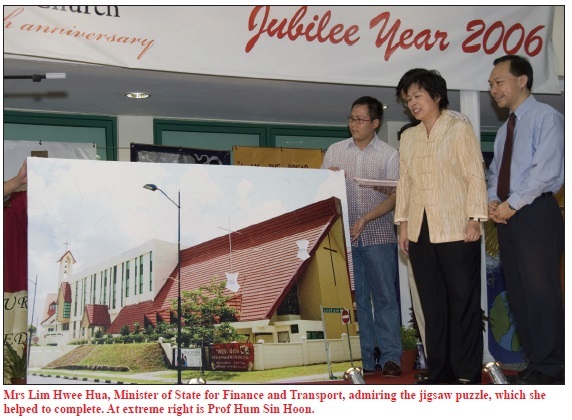 During the activity-filled dinner, our special guest, Minister of State for Finance and Transport and an MP for Aljunied GRC, Mrs Lim Hwee Hua, and Bishop Dr Solomon helped to complete the last piece of a jigsaw puzzle, which shows a picture of Trinity Methodist Church. Mrs Eileen Smith-Barritt, wife of our former pastor, the late Rev Christopher Smith, shared how God turned seeds of prayer to fruits of ministry. 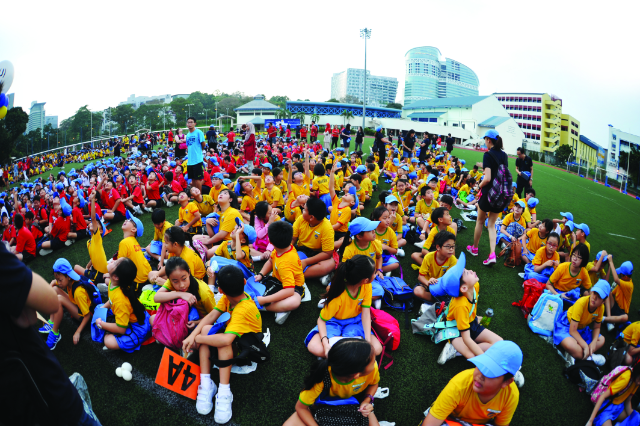 Diners were entertained by fond memories from our “old boy”, the Rev Malcolm Tan, who today pastors Barker Road Methodist Church, and newer memories by a 10-year-old, Miss Yeo Su Min. The colourful banners made by church members were once again paraded around, this time in front of the judges of the banner competition who were hard-pressed to decide on the winners. The final decision was unanimous. A striking banner with the word “Love” written in Chinese positioned on the centre of a cross, accompanied by the symbols representing Alpha and Omega placed on either side of the cross, was awarded the top prize. To sum up a wonderful evening, we shall end with the words of our Pastor-in-Charge, the Rev Philip Lim: “The worship service was great! 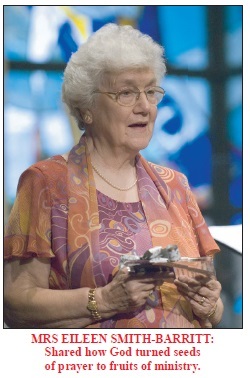 It was not a performance but the use of our gifts and talents to thank God for 50 years of ministry at TMC. And I didn’t know that we have such great talents in our midst! 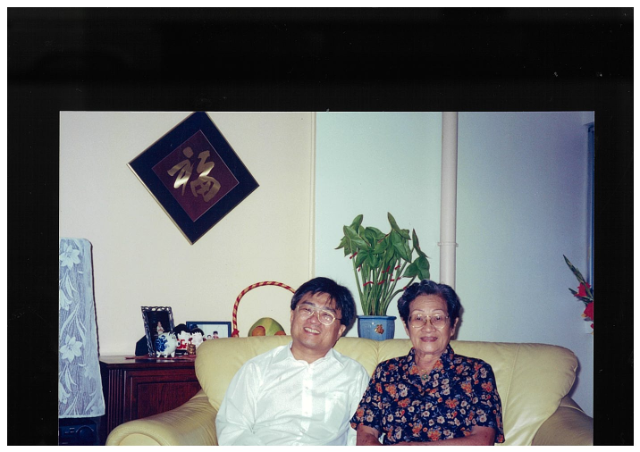 Lim Sue Yien is a member of Trinity Methodist Church. — The Rev Philip Lim, Pastor-in-Charge, Trinity Methodist Church.